Digital marketing displays offer so much more than simply showing pictures of new models and features to potential car buyers. Our professional grade iPad and Android fixtures include freestanding, countertop, and wall-mounted tablet enclosures and interactive kiosks that can accommodate almost any device or content. Freestanding and framed automotive marketing displays with bold graphics are ideal for cross-selling and attracting the attention of showroom customers. Classic wall mount framing is a great choice for lobbies, sales floors, or service areas, while counter and desktop models are great for targeted advertising. Space saving slatwall displays offer efficient, high visibility accessory marketing. Freestanding fixtures and wall-mounted panels are ideal for attracting customer attention to accessories, parts options, and branded merchandise. Modular slatwall brochure displays help consumers make informed service or repair decisions while minimizing floor space use. Auto advertising flags. Do we need to say more? Is there really anything more iconic than a line of fluttering banners beckoning customers into a lot full of shining new (or used) cars? Our pre-printed advertising banners attract customers to the full range of specialized vehicle products and services. Did you ever notice that car dealership display fixtures are a microcosm of the industry itself? They both feature a constant influx of "latest and greatest" models that take advantage of new technology, with a bedrock base of steady, solid, classic styles with proven staying power. High visibility car dealership display fixtures serve a variety of purposes: attracting and bringing in traffic; directing customer attention to new or updated models; informing them about options and services; and — finally — closing the sale. Add to that mix a showroom that spans indoors and outdoors, a product that weighs multiple tons but comes in 1000s of configurations, and the high ticket price and a customer base that is both well-informed and eager to save as much as possible. Commercial quality car dealership display fixtures, also called auto industry sales and marketing accessories, span a wide range to meet the whole variety of automotive merchandising needs. 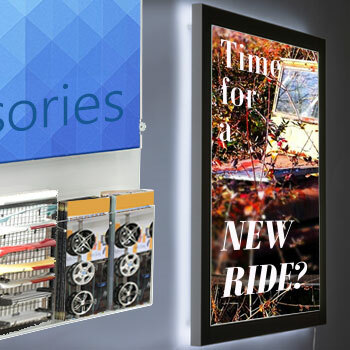 StoreFixture.com offers fast shipping and low, wholesaler pricing on everything from simple slatwall hangers and hooks to monster advertising banners designed for outdoor lots and cutting edge, customized tablet kiosks. Digital display fixtures for car dealerships are constantly evolving. High tech advances in automotive designs, options, and service can fail to impress customers if the marketing isn't perfectly on-point. Today's technology-savvy automotive consumers don't want to just hear about a vehicle and then hop in it and drive away. Vendor-provided and custom dealer apps add interactive value to the buying experience by adding "build your own" functionality, videos showcasing performance and safety highlights, and virtual environments that allow buyers to test drive in the Alps or the desert in addition to around the block. Customized marketing display kiosks use securely installed iPads and tablets to let customers check in online, post status updates for their friends to see, sign up for mailing lists, and design their dream ride in addition to showcasing high quality multimedia marketing materials. In addition, counter, desktop and handheld fixtures allow sales and service staff to instantly update quotes, estimates, and pricing. 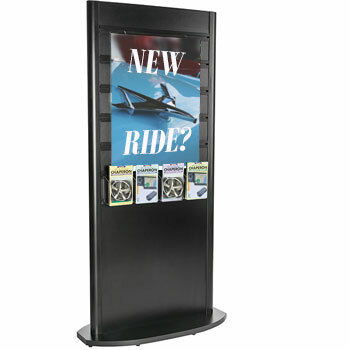 Traditional advertising fixtures and accessories like customized posters and brochure racks create truly integrated marketing displays that help increase interest and boost sales. Digital advertising is great, but nothing beats classic framed advertisements for passive sales. Framing posters is a great way to showcase new models, special sales events, and service offerings. Framed graphics turn empty wall space into a chance to attract customer interest without hard-selling, and are a key element of any integrated marketing strategy. Customized and branded poster-size advertising and messaging campaigns offer automotive dealerships an economical way to integrate advertisements for in-house cost centers such as service, parts, and repair divisions, leading to an increase in overall revenue volume as well as profit margin and, most importantly, absorption rate. Consistent, branded print advertising is one of the easiest ways for auto dealers and service centers to increase both purchasing and retention. The low price of printing marketing display graphics allows large-scale wall ads to keep up with frequently-changing specials, changing models, and offers. Easy-to-access wall mount and counter frames, such as our "snap-frame" designs that allow posters to be changed without un-mounting the enclosure, make it easy for showrooms, parts and repair centers, and service areas to keep up with marketing campaigns. Countertop framing styles offer even greater ease of access and are perfect for ensuring that every cost center, and every sales desk, takes advantage of both active and passive sales processes. Vehicles take up a huge amount of space in showrooms and lots. Auto accessories, service desks, parts displays, and branded merchandise ranging from keychains to apparel take up even more. In today's hyper-competitive automotive marketplace, it's no longer enough to simply sell a customer a car, truck, or SUV once every few years. Vehicle purchases have become the start of the customer lifecycle, rather than the goal. Slatwall display fixtures are ideal for showcasing accessories, service options, specialty orders, and brand/imaging merchandise that will help increase both customer satisfaction and absorption rate. 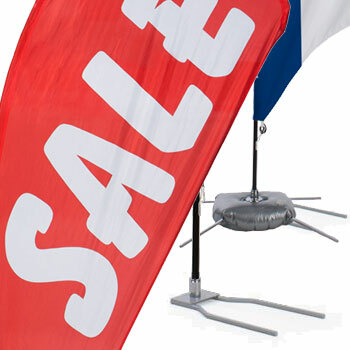 Auto marketing flags have long been used to advertise promotional events and move inventory. Four-season advertising banners are one of the most economical marketing accessories for automotive dealerships. These hard wearing, high visibility displays feature stock and custom messaging that alerts customers to special events and services. Marketing banners are available for both indoor and outdoor use, with a variety of base options for maximum stability in any environment. Custom replacement flags are an ideal way for dealers and service centers to ensure advertising stays current with stock and offered options. Today's competitive automotive sales market requires high visibility integrated advertising campaigns that span traditional and digital systems methods. Customer loyalty and retention are driven in large part through active advertising programs that range from social media updates to classic on-site event marketing and promotions. 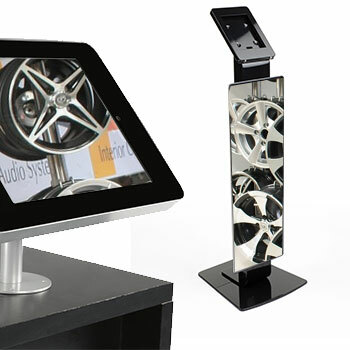 StoreFixture.com offers a huge selection of display fixtures and accessories designed to allow dealers and automotive service centers to focus on driving sales in a competitive marketplace. From low-price pre-printed blade flags to countertop picture frames to elegant waiting room furniture and guest chairs and cutting-edge digital device displays, our goal is to provide every customer with scaleable and economical display solutions.